Just 5 days to go and it will soon be Halloween! Thinking of a Halloween jewelry inspired to wear for your Halloween Party? Try these Halloween jewelry making tutorials you can learn. Only $2.32 a month, you can access over 70 jewelry making magazine issues and over 500 jewelry making tutorials. 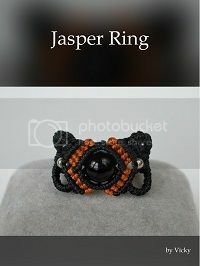 Here are a few tutorials for black, orange and gothic inspired handmade jewelry you can learn and wear! The Web Pendant – Here is a tutorial that for sure you’ll have fun creating! The Web Pendant will teach you how to perfect your wrapping techniques by creating a web-like weaved wires. You’ll also learn how to make loops and use these techniques in creating various designs for wire jewelry. 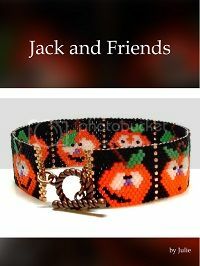 Jack and Friends – This is a flat odd count peyote pattern. As designed the bracelet measures 6 3/4 inches in length by 7/8 inches tall. There are 17 columns and 101 rows. The bead count is 1709 and I used 7 different colors. Jasper Ring – Here’s a beautiful ring, with a Jasper stone at its center, but you can substitute the bead with what you like best as long as it retains the right measurements. This pattern can be used to make a bracelet. Halloween Ghost – This scared little ghost is so cute with his smiling jack-o-lantern. 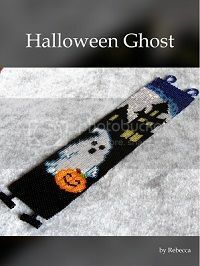 This is the perfect Halloween peyote bracelet pattern! 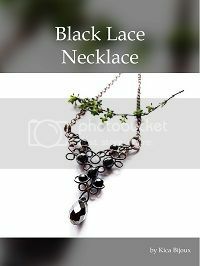 Black Lace Necklace – Making this pendant doesn’t require glue or solder. Pictures and descriptions are designed even for those not yet self-confident enough to call themselves intermediate wire-wrapping artists. 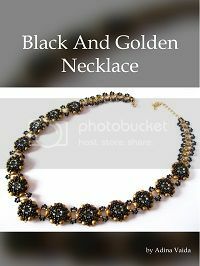 Black and Golden Necklace – This PDF beading tutorial includes instructions for an elegant necklace. You would love to make this double-sided necklace in more color combinations! Ebony and Ivory Bracelet – Using Herringbone Stitch you can weave brick beads and create a diamond shape. Since the center of the diamond is flat, it is a nice base for embellishments. Gothic Chandelier Earrings – Learn to create an all- black theme wire chandelier earrings. Black is mysterious, black is elegant. Both mysterious and elegant is a perfect description for a Gothic Chandelier Earrings! 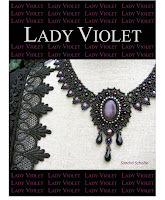 Lady Violet – Beautiful, black and elegant cabochon pendant with a lace-like necklace style. ACCESS MORE TUTORIALS FOR ONLY $2.32 A MONTH WITH THIS SPECIAL OFFER FROM GOLD MEMBERSHIP!! !